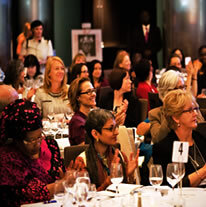 The particular climate change related needs and responses of women were highlighted at an event called Leaders’ Forum on Women Leading the Way: Raising Ambition for Climate Action, that was co-hosted on the eve of the UN Secretary General’s Climate Summit by UN Women and Mary Robinson Foundation - Climate Justice. Women leaders representing grassroots and indigenous, young women and academics sat down with former Heads of State and Government, policy makers, heads of civil society, international and private sector organisations to discuss robust climate action that is good for people and good for the planet. Michelle Bachelet, President of Chile, highlighted the need for transformative leadership and called for more gender sensitive climate action in her keynote address. 22 September 2015, New York. Given existing gender inequalities and development gaps, climate change ultimately places a greater burden on women, because the societal and cultural roles and responsibilities made on them by families and communities are very different. This means there is a need for a more gender sensitive response to climate change and the inclusion of women in decision making processes around and beyond the 2015 climate agreement. Women across all sectors of society are already leading the way in efforts to build resilience and adapt to the impacts of climate change, and they are demonstrating their unity, collective ambition and their willingness to act with urgency, regardless of societal or political position. Women’s agency plays a key role in driving innovative climate action and their participation in the ongoing climate debate is a key factor for a fair and equitable climate agreement. The UN Secretary General’s Climate Summit 2014 gathered world leaders in New York, in September, as part of a global effort to mobilise action and raise ambition on climate change action in the lead up to the 2015 agreement. 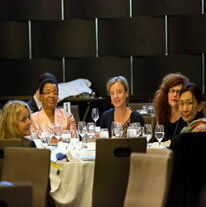 In order to enable women’s participation in the processes and highlight their voices in the ongoing discussion, UN Women’s Executive Director Phumzile Mlambo-Ngcuka and Mary Robinson, President of the Mary Robinson Foundation – Climate Justice hosted a Women Leaders’ Forum on Climate Action in the margins of the UN Climate Summit in New York. 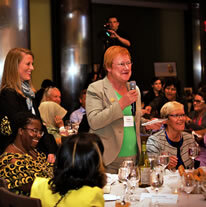 The event, titled “Leaders’ Forum on Women Leading the Way: Raising Ambition for Climate Action”, brought together women leaders who are actively working on climate change issues, from a variety of constituencies to highlight the challenges they face as well as the solutions they are already offering. 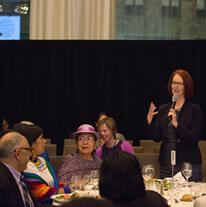 Travelling from 54 nations, and urging concrete action, women leaders representing grassroots and indigenous, young women and academics sat down with former Heads of State and Government, policy makers, heads of civil society, international and private sector organisations to discuss robust climate action that is good for the planet and good for people. They came together in an inclusive and participative dialogue that enabled the attendees to talk about the reality of the impact climate change is already having on the ground, and empowered women to discuss innovative solutions. 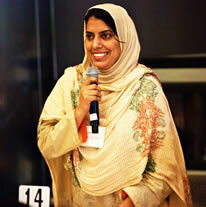 Participants were selected by drawing on networks and organisations with strong links in the climate and gender constituencies, including WECAN, ClimateWiseWomen, The Huariou Commission, the Green Grants Fund and GGCA. – Mary Robinson speaking at the thematic session during the UN Climate Summit and summarising the spirit from the Women Leader’s Forum. 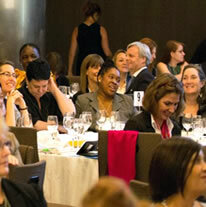 The main part of the event, the learning circles, was informed by keynote speeches and a panel discussion. The key note speakers included Michelle Bachelet, President of Chile and UN Secretary General Ban Ki-moon, who both highlighted the need for transformative leadership and called for more gender sensitive climate action. – Alina Saba, a Mugal indigenous woman. 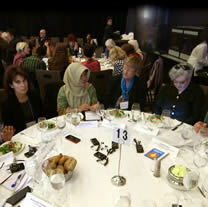 The dialogue at the event took place in 12 learning circles, round table discussions with representatives from each constituency, which were chaired by former Heads of State and other high-level women leaders, who were acting as “voices” of the represented participants to carry their messages into the public sphere after the Leader’s Forum. Each learning circle agreed to a set of key messages to be carried into the UN Climate Summit the next day, which were captured by experienced rapporteurs and recorded on video by the chairs. This innovative, people-centred format empowered women from grassroots, youth and indigenous constituencies to be in direct conversation with policy makers. How are you working in partnership to maximise the positive impact of climate actions on people’s lives? What steps are being taken to ensure participation by those most affected by the impacts of climate change in these partnerships? Understanding that men and women are impacted differently by climate change, how are you designing climate responses to address these differences? What risks does climate change pose to development and to business? Is there a role for the post-2015 development agenda in addressing these risks? To summarise the discussion in each circle, a representative from each table was asked to share “three words for climate justice”; three words that would best represent the issues raised and encapsulate the key messages from the women leaders, with those gathered in the room. Not surprisingly, a lot of these revolved around gender sensitive climate action, women’s empowerment, participation, accountability, equity and leadership. Courage – leadership to make hard decisions to save the planet. Voice – the need for political leaders to listen to women, youth and marginalised groups and to take seriously what they say. Solutions – the need for solutions that are not only adequate for current generations but also for future generations. 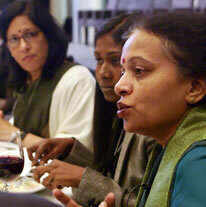 The women in this learning circle distilled their discussion in a key message around “transformative leadership today”. They highlighted the need for women’s leadership that is transformative, a leadership where women can act not as victims but as agents of change. This learning circle was engaged in a discussion about the key themes of “clean energy, justice, accountability, equity and political will”. Participants agreed that there was a need for climate change issues to be linked to people’s engagement, democracy, governance and human rights, and that a lack of accountability and transparency at the international level affects action on the national level. The key messages from this learning circle were recorded by Mary Robinson, President, Mary Robinson Foundation – Climate Justice. Participants in this learning circle focused their discussion on “indigenous and local knowledge” and put a strong emphasis on the need for women to be included in discussions around climate change issues as they are most affected by its impacts. The participants in this learning circle chose the key words accountability, inter-generationality, interdependence and solidarity to represent their discussion. They emphasised that “We, women leaders are responsible to act for combating climate change now, and our action must bring concrete and effective results”. This learning circle discussed the need for global solidarity in coping with the effects of climate change and emphasised the need for women’s empowerment, from the grassroots level upwards – in order to be involved in all decision-making. Participants in this table discussed how women leaders are acting on climate change at many levels of society – community, advocacy, research, analysis, as activists and leaders in organisations, including state and non-governmental, financing, corporations, unions etc. This learning circle discussed key strategies and approaches the participants are using in their current climate action. The key messages evolved around the need to integrate human rights into climate action, the need for a more informed public and political discourse, urgent action, results and the need for accountability “vis-a vis those most affected”. Struggle – with some of the powerful forces at work that women need to fight against. 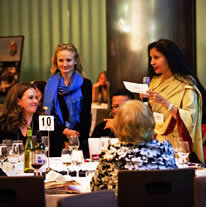 Community – the need for the women to work together in solidarity, finding alliances, building coalitions. Engaged – the women know that they are part of a much wider (global) network, they make connections and they make them work for their own communities. Practical – practical approaches to secure daily needs. 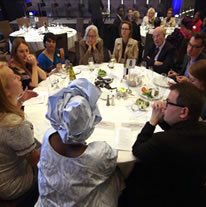 This learning circle discussed the barriers to women’s participation and engagement in climate change action, recommendation for the empowerment of women and the need for gender equality and women’s empowerment to feature prominently in on-going intergovernmental discussions, such as the post-2015 development agenda and the SDGs. – Sylvia Atugonza Kapello, Ugandan climate and development expert. 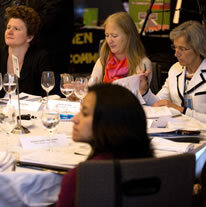 Women’s empowerment, participation and leadership were also key themes discussed at the thematic session on “Voices from the Climate Frontlines” (organised by UN Women, UNICEF and UNFPA) at the UN Climate Summit the next day. Leaders’ Forum participants including Mary Robinson, Sylvia Atugonza Kapello, Christina Ora and Alina Saba were panellists at the thematic session. Outlining the issue of participation, Alina Saba, a Mugal indigenous woman, said: “People on the front lines of climate change don’t have access to resources and don’t have a voice”. The strong messages from the Leaders’ Forum were also strongly emphasised by Graça Machel, the Elders, who was a prominent guest at the Forum and held the closing remarks at the UN Climate Summit. During her closing remarks (see video below) at the Summit, Ms Machel referred to the three key words from her learning circle at the forum, “courage”, “voices” and “solutions”. – Graça Machel referred to the three key words from her learning circle in her closing remarks at the UN Climate Summit.